Amos Alonzo Stagg Coaching Award winner Nick Saban hoists the BCS championship trophy after his Alabama Crimson Tide defeated Texas 37-21 in the BCS title game. University of Alabama head football coach Nick Saban will be at the United States Sports Academy’s Daphne campus to receive the 2009 Amos Alonzo Stagg award for outstanding men’s sports coach of the year at 4:30 p.m. Tuesday, 18 May. Saban, who earned his second career national title as a head coach this past season, will be presented the award at the Iron Bowl Monument, located on the campus near the corner of One Academy Drive and Main Street. The public is invited to attend the ceremony free of charge. 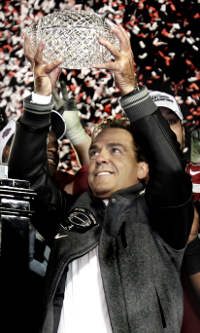 Saban also won the 2003 BCS championship at Louisiana State University. He has a career college record of 124-50-1 and is 33-8 during three seasons at Alabama. The Academy has been awarding the Stagg Coach of the Year Award since 1984. Late Grambling coach Eddie Robinson, who was the second to pass Stagg on the all-time college football coaching wins list, was the inaugural recipient of the award. Other past winners include Penn State’s Joe Paterno (1989 and 2001), Florida State’s Bobby Bowden (1992) and Duke and U.S. Olympic basketball team head coach Mike Krzyzewski (2008).